If you have ever tried to return a value that physically lies to the left of the lookup column, you quickly realize that this task is difficult to accomplish with the VLOOKUP function. 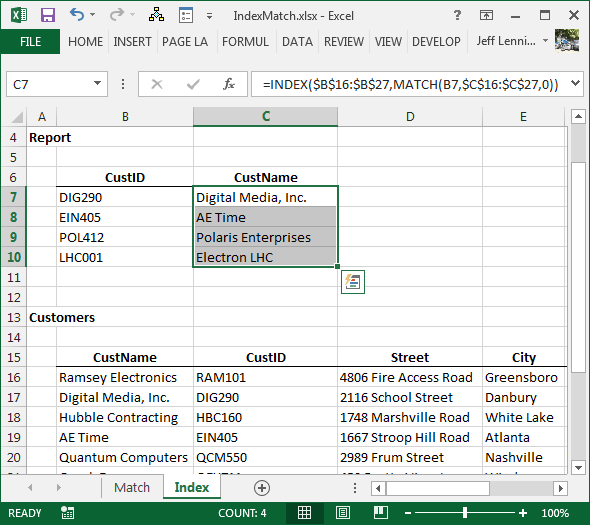 This is a perfect time to move beyond the VLOOKUP function and explore the INDEX and MATCH functions. And this brings us to the reason we are here, to get the hang of using the INDEX/MATCH combination to return values that lie to the left of the lookup column. But wait, there’s more. In addition to being able to return values to the left, this combination doesn’t suffer from another common limitation of the VLOOKUP function. When the third argument of VLOOKUP is expressed as a static integer value, such as 3, a column inserted between the lookup column and the return column will break the function. Since the third argument is expressed as an integer, it will not adapt to column inserts when inserted between the lookup and return columns. The INDEX/MATCH combination does not suffer from this limitation. Since the arguments are range references, Excel adjusts the formulas to accommodate column inserts. Alright, enough talk, let’s get to it. Let’s take them one at a time. The MATCH function returns the relative position of a list item. If we asked Excel to MATCH “Jun” in a list of month abbreviations, it would return 6. “Apr” would return 4. This idea is illustrated in the screenshot below. We are trying to find the relative position of our month (C6), in the list of month abbreviations (B11:B22), and zero for exact match. Just remember, the MATCH function returns the relative position of a list item. Where the MATCH function figures out the row number argument. The MATCH function returns the relative row number to the INDEX function. The INDEX/MATCH combination is quite handy, and can be used to return values that lie to the left of the lookup column. * There is a very creative way to have the VLOOKUP function go left, which is to use the CHOOSE function as the second argument. Wow, when I read Richard Schollar’s post on Bill Jelen’s site, I was so impressed! Well done! ** The thing that can be often confusing for long-time VLOOKUPers is the order of the arguments. VLOOKUP begins with the value we are trying to find. We think about the VLOOKUP function like this: go find this, comma, in here, comma, return this. When using the INDEX/MATCH combination, the thinking reverses. We first specify the column that has the value we wish to return. The thinking becomes this: from this column, return this value. I was looking for this from many day. can I like this comment? same here! Wow! Thanks a million. This help me so much and your explanation was simple enough that I understood what I was doing. Thanks again! That is a fantastic skill!!!!!! Millions of thanks it saves me so many works on Excel and even VBA!!! Thanks. I was looking for this excel ‘trick’ for getting help in my data nalsyis. I have been using =IFERROR(INDEX($F$13:$F$1353, MATCH(0,COUNTIF($X$12:X12, $F$13:$F$1353), 0)),””) and it work perfectly in order to bring unique values from a column with repeated values. However I use a filter on the repeated values column “F” and when I deselect any item from the “F” filtered column I would like to have this item removed from the unique items list created. Couldn’t figure out a formula to make this work. why excel cannot develop vlookup-left function? same as hlookup-up? same format of functions, right? The INDEX() function in Excel can go left as you pointed out. It returns a value given the intersection. I recommend using MATCH() with it to make the formula versatile. Wonderfully explained and has saved me so much time. Thank you very much! Well done! One of the clearest and most concise articles on Excel I have seen. thanx, helped me solve my back column vlookup issue. Brilliant !! Thank you so much for saving me lots of frustrating hours trying t solve this “leftie-vlookup” thing! Thank you for explaining how to think in “notes **”. That made it all clear to me! I believe you are looking for SUMIFS(), AVERAGEIFS(), COUNTIFS()…They give you the result of every row that matches your criteria:) If you need further help, I’m happy to assist in any way I can! Thanks a lot for this, Jeff. Much appreciated. I have this working. Now the only thing is, if the text doesn’t have a match it returns #N/A. I would like it to return a 0 when there isn’t a match. How do I do that? Thank u so much sir….you explained it in a very simple way.. Thanks you So much. It is working great. I need to set up a list of race practice times from fastest to slowest, reading values from a master sheet completed by the runner. There is only one practice time for each day. I have a list of times from fastest to slowest (SMALL fn). I’ve then used VLOOKUP and INDEX/MATCH to find that time (eg. fastest, 2nd fastest) on the master sheet and return the date for that race time. However, where two or more race times are the same, the same date is returned all, even though all 2 or 3 races were run on different days. I get the same outcome with both VLOOKUP and INDEX/MATCH. How can I display the unique date relating to each race time (ie. the date that is in the same row as the race time)? Grateful for any advice you can provide. I’m not sure if I am reading this correctly, but have you tried just sorting the data by race time and date? You can apply a custom sort and sort by time and ,within each time, by date, so it gives you the earliest date first when you run the same times. What If I have repeated values to be lookup for. Example what if Ramsey Electronics and Digital Media, Inc has the same cust ID, it will return only 1 value. How to go about it? thanks, saves a lot of time!! To the million thanks you have received already, let me add a zillion or two. A brilliant explanation of a very complex set of functions. It all worked first time for me and I learnt a lot in the process. Thanks very much. Now for example there is no entry for the month of (Jan’2017) in table 2 however this cust_id will be present in table 1 and we want to have that entry same credit line as of the previos month. I tried the “Choose” trick on a couple of hundred lines but it is REALLY resource intensive, seems it is only useful if you have information in a couple of lines only. Thanks a lot for this post! Explained in a clear way. I already lost hours, figuring out why LOOKUP wouldn’t return my value. It did give me one, a random one. I even reinstalled excel. Only to find out LOOKUP / VLOOKUP doesn’t go to the left. Darn. This does exactly what I’ve been looking to do for the longest time! Thank you so much for posting it, and in a way that made it super easy to use! I have a an excel tabulation of where i need to establish a formula for a personeel where rate is available in another tabulation but satisfying a nationality and position, can you please assist. I like the INDEX function, but I always solved this issue using OFFSET, now I have another tool. This was super helpful for a difficult to search subject in Excel, thank you! Exactly what I was looking for, thank you for the very clear explanation. Thank you very much for your assistance. Actually this is great fully assisted. Great; I were wondering how to get this; Highly appreciate. Question: Now that I have mastered the index/ match function may I use this to perform a bank reconciliation instead of v look up? Thanks for the help!